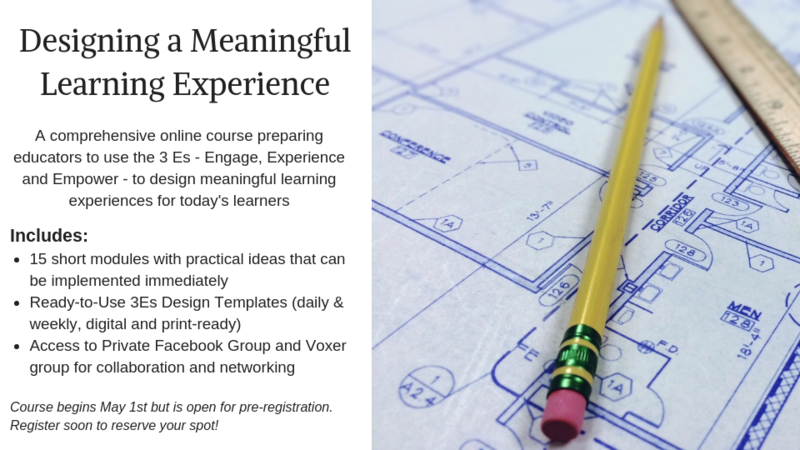 Designing a meaningful learning experience is not always an easy task. I've talked to so many educators that get it and understand how important it is. They just aren't sure where to start. Now, there's a place to start! Using the 3 Es, it can be done in a way that makes sense. The 3 Es Design Template will help you find creative ways to engage your learners, create an experience that will cause them to want to invest, and empower them to take the learning beyond the walls of the classroom. Subscribe to receive instant access to the ready-to-use 3 Es Design Template as well as inspiration and innovative ideas dropped into your inbox. ​ Don't forget to come back and check out some of the resources below to help guide and prepare you to use the 3 Es Design Template. How can you use the 8 Cs of Engagement (Silver and Perini, 2009) to give learners a reason to want to learn? How can you give your learners an opportunity to learn by doing while giving them a reason to invest in the learning? What choices will they have? How will they apply the learning? How will I know if the experience left an impression? How can you encourage your learners to apply what they have learned in a real way? How will learners reflect on what was learned? How will learners connect learning beyond the walls of the classroom? How will they share those connections? How can learners use what they have learned to create change or make an impact? Want Andi to visit your organization to share the 3 Es and prepare educators to use the tool in their classrooms to design meaningful experiences for their learners?